Persistent storage can be used for database storage, or storage of stateful information that needs to be referenced by multiple application instances. For sensitive information like passwords or tokens, please use either Secrets or Environmental Variables, also referenced in this section. 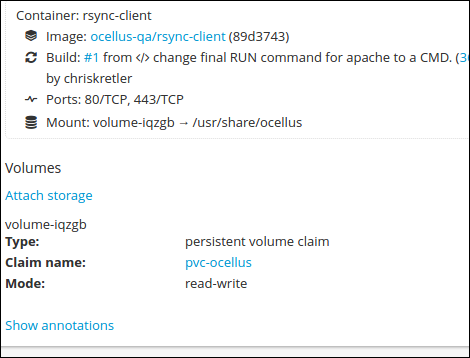 The OpenShift documentation for claiming and utilizing persistent storage is here. In the resulting form, specify the mount point for the claim within your apps. Note:If you are modifying a multi-pod deployment config, all pods will mount the claim at the same place, unless otherwise specified. After you click ‘Attach’, your pods will be automatically redeployed with the storage attached. 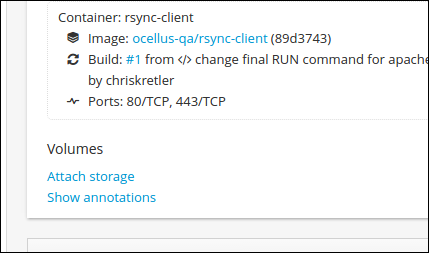 oc rsync -c 'apache' mypod-1-53r40:/usr/local/apache2/local/certs . Note: In this example the user is rsyncing files from the 'apache' container of a pod called 'mypod'. Similar syntax works for rsh'ing to that container.